Anime Studio Debut is an off-shoot of Smith Micro's 2D art program, Anyone Can Create Manga and Comic Art!. It uses a "bone" interface as its core. You use a tool to add bones to the structure of a drawing. You can then animate these bones, and you can adjust their strength to behave more like real bones. 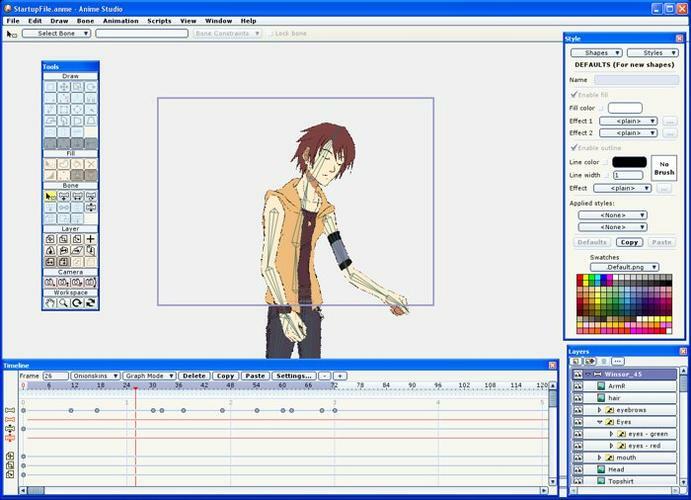 Anime Studio Debut ($50, 30-day free trial) can also animate based on edges of drawings and in many other ways. It includes a straightforward timeline system that allows you to intuit when and how animation happens easily. Note: Anime Studio Debut is the introductory version of the program and costs US$50. The Pro version, which includes 3D support, output in high definition, and advanced lip synching, costs US$200.